Summary of "In Bed". 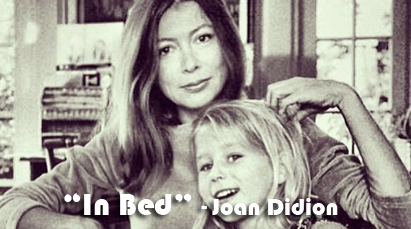 "In Bed" was written by Joan Didion. A very short description/introduction about Joan Didion. Joan Didion (born December 5, 1934) is an American author best known for her novels and her literary journalism. Her novels and essays explore the disintegration of American morals and cultural chaos, where the overriding theme is individual and social fragmentation. A sense of anxiety or dread permeates much of her work. Joan Didion was born and raised in Sacramento, California, to parents Frank Reese and Eduene (née Jerrett) Didion. Didion recalls writing things down as early as age five, though she claims that she never saw herself as a writer until after being published. She read everything she could get her hands on after learning how to read and even needed written permission from her mother to borrow adult books, biographies especially, from the library at a young age. With this, she identified herself as being a "shy, bookish child", who pushed herself to overcome her social anxiety through acting and public speaking. As a child, Didion attended kindergarten and first grade, although, because her father was in the Army Air Corps during World War II and her family was constantly being relocated, she did not attend school on a regular basis. Then, in 1943 or early 1944, her family settled back in Sacramento, and her father went to Detroit to settle defense contracts for World War I and II. Didion wrote in her 2003 memoir Where I Was From that moving as often as her family did made her feel like a perpetual outsider. I sleep from three to five times a month during the day because of migraine headache. I become unconscious and I don't know anything when I sleep. Suddenly I feel physical uneasiness and I feel there is a heavy flow of blood vessels in my brain then I know I am suffering from migraine. It is the main problem in my life. I work after taking medicine. In the beginning, I ignored it and challenged my physical structure. I used to lie about my migraine in many documents in the hospital. It was very shameful matter for me to sleep two or three times a weak because it proved all bad thinkings, bad attitudes, mean feelings etc. I have no brain tumor, high blood pressure but I have only migraine. I used to tolerate it., go to work, go to attend lectures on Middle English Literature. I used to teach to advertise, vomit in toilet, pour ice in my bed. I used to reduce my pain. I wished the surgeon would come and operate my blood vessels. I was compelled to accept and learn to live with my migraine. I was not imaginative. It was a hereditary disease. It is not as serious as any other headache. I caught it at the age of eight. Allergy, worry, temperature, very dreadful happening, expected event, tiredness, etc. cause migraine. It can be caused by nerve hormone. Some tablets of aspirin can cure such ordinary headache but it has many side effects. They only prevent the pain but when pain begins nothing can cure it. Some people get hallucination and they say that they get blind effect, headache, stomach pain, loss of understanding, tiredness, etc. I can't speak and see anything when I suffer from it. I feel as a drunkard. I thrill, vomit, sweat, and feel weak. But I know that no one dies of migraine. Those persons who do not suffer from migraine suffer very much when they blame rather than it gives pain. But I am lucky because my husband has also migraine. Doctors say that ambitious, intolerable, perfectionists get migraine but no one can be beyond heritage of migraine. Now I know to vaccinate myself once a day. So, I don't care this disease but I'm suffering too much. There is an agreement between me and my migraine. It doesn't occur when I have a great strain and it comes to normal condition. I don't fight it. I sleep and I let it occur on me. I pay attention to only migraine. It runs away in ten or twelve hours and all my anxiety, strain, go away with it. I feel easy and fresh. I feel as if I walked in the fresh air, eat happily, sleep well and I am delighted. The main concern of this powerful personal essay is the migraine headache. The writer Joan Didion describes it in general and her own in particular. She has described’ her physical tension aroused by the pain of migraine in her right temple. She often felt ashamed to check frequently in application form. She had fear of the respect of mankind. In the same time she turns to the human concept toward migraines. She says that people often have misconception about this disease. She comes to the objective point of medical knowledge. It happens not by brain tumor, eyestrain, high blood pressure. Migraine headaches are not imaginary. Migraine is something more than the fancy of a neurotic imagination. It is an essentially hereditary complex of symptoms. Almost any thing can trigger a specific attack of migraine: stress, allergy, fatigue, a flashing light, a fire drill etc. She again talks about personal experience at the point of heredity. She says that her grandmothers’ had migraine. Her father and mother had migraine. From heredity, she turns tq the chemistry of migraine. In the time of severe pain she is fully upset. Physically and mentally she suffers. She says that her husband has this migraine, too. Sufferer hardly can pass days easily. The writer comes to conclusion by asserting an intellectual response of confronting this disease with tolerance and concentration on the pain for some time like in yoga. The pain dies and she has relief afterwards. We may concentrate our daily household jobs and other activities to divert from the pain of migraine. 0 Response to "In Bed [By-Joan Didion] | Summary"